Link to more detailed map here. The routes are meant for day time trips. The most straight-forward route would be taking the boat and getting of Rachawongse Pier. 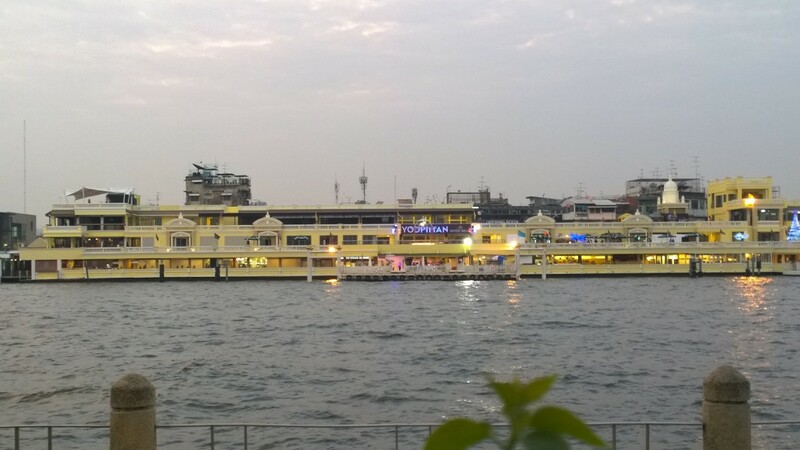 If you are in the Flower Market, the nearest pier will be in the Yodpiman Riverwalk ( get on the large pier in the middle of the riverwalk, the small one at the end just crosses the river to Wat Kalayanamitr ). In the Chao Phraya Express Boat site, they haven’t updated Yodpiman into their map. Actually the Rajinee and Memorial Bridge Piers are no longer in service. After you get off the boat, just walk up the road to the main intersection and turn right. That will be the Yaowarat Rd, which is like the center of Chinatown. Yodpiman Riverwalk , viewed from the other side of the river. Motorcyclists use this route as a shortcut to Chinatown. Sometimes they get fined cuz they have to ride their motorcycles against traffic or on the sidewalk to get to the entrance. If you have enough of the crowd at the Flower Market, this route will be a bit more peaceful. It’s like getting to Chinatown through the backdoor. The yellow pinpoint on the map is the entrance to this route. Cross the road and walk into the lane. This lane will cut through several main roads. You can find almost everything for sale here. There are stationaries, towels, clothing, fabric, tubberware, bags, shoes , etc… It’s like ebay exploded into tiny little shops there. Usually if you buy at least 3 items, the seller will give you a wholesale price. You can turn left and walk to the intersection, then turn right into Chinatown. Or you can continue into this lane and turn left at Mangkon Rd.